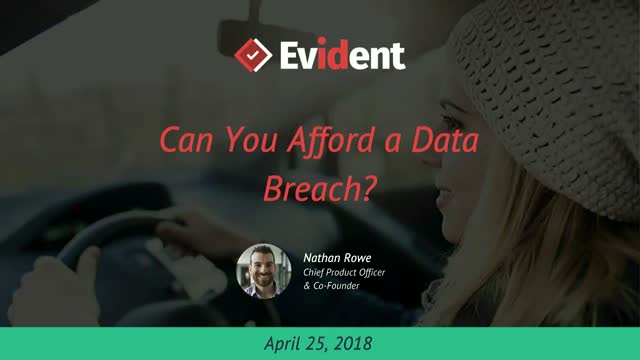 Can You Afford A Data Breach? 3.7 million personal data records are stolen every day. That’s 44 every second. The number increases every year, while at the same time we are digitizing even more about ourselves. Despite intense attention and new regulations, cybersecurity simply isn’t improving at an acceptable rate. Businesses are unable to keep up with the barrage of attacks. Even companies with deep expertise in data, such as Equifax, Deloitte and Yahoo have suffered significant data breaches. When everyone including the experts are falling behind, you have to ask yourself: Isn’t something fundamentally wrong with the way we handle personal data? How is it that attackers can act with near impunity, while well meaning companies and regular users cannot keep anything secret? Cybercriminals can easily monetize stolen data, either by leveraging it themselves for fraudulent activity, or by selling it –– either way, they’re getting paid. Digitally innovative hackers who target non-profit, educational, government, and other industries with minimal cyber defense mechanisms often find it easier to steal financial or medical records than it is to steal actual money, which further contributes to the value of personal data. Companies are handling and collecting more and more personal data than ever before… just one small lapse or vulnerability, and a hacker can potentially gain access to volumes of sensitive personal data. In this webinar, we’ll discuss why it’s just as important to safeguard your employees’ and customers’ personal data as it is to protect your bank account. 2018 was an important year for cybersecurity and privacy. The General Data Protection Regulation (GDPR) went into effect and the California Consumer Privacy Act (CaCPA) passed amid a flurry of high-profile cyber attacks. While some organizations have prioritized compliance with the aforementioned regulations to prevent further damage and secure their reputations, others have simply treated them as suggestions for best practice, and have not yet implemented comprehensive processes and infrastructure to thwart cyber attacks and data breaches. Such a broad discrepancy in how companies are tackling their cybersecurity and data protection efforts begs the question: What will happen next year? In this webinar, we’ll discuss cybersecurity trends for 2019, with a focus on best practice recommendations as well as preventative measures that organizations can implement to protect themselves, their employees, and their customers from risk. "Why Background Checks Should Be a Part of Your IT Security Program"
The term “background check” is not particularly well-defined –– it can mean many different things to different companies, and can also vary from type to type (and from vendor to vendor), but ultimately, having the right background checks in place can help organizations avoid serious IT and cyber security issues. Those who have never purchased background checks can be understandably confused and overwhelmed by the broad range of options, when selecting the right check can be as simple as evaluating them based on a few key factors: cost, scope, diligence, and regulatory compliance. Determining the best checks for your specific business needs can be a challenging undertaking. Some companies require background checks that are more comprehensive, while others may opt for checks that are less detailed and less costly. In this webinar, we’ll discuss the most common background checks available today, how they support a comprehensive IT cyber security program, and their applications in several different use cases, ranging from small businesses to enterprise-level organizations. In today’s digital landscape, is it possible to know with absolute certainty that someone is who they say they are online? Physical documentation like social security cards, driver’s licenses, school IDs, and law enforcement credentials can easily be obtained by imposters, and identity proofing is key to avoiding risks associated with theft and impersonation. Businesses can and should leverage identity verification now more than ever to reduce friction in their onboarding processes, prevent fraudulent users from accessing sensitive data, and build trust in their brand. Companies no longer have to choose between growth and security––new technologies are helping organizations of all sizes operate with confidence, knowing their constituents have been accurately verified. In this webinar, we’ll outline the fundamentals and the importance of identity proofing, while providing practical tips for implementation across a variety of use cases. D-Day is right around the corner. By now, most companies are nearly completed with putting the necessary steps in place to meet the requirements. However, it is suspected that many companies will end up spending significantly more money per year meeting these regulations. Also, it is most likely that most of these changes have added more complexity to their business operations. Yet, it doesn’t have to be this way. This webinar will highlight the 10 key considerations that need to be made for controlling how data is accessed, stored, kept up to date, transferred and deleted. It will then breakdown methods to optimize the processes and technology used to address these requirements in a way that will significantly lower the effort and cost of your company’s operations. The internet is a rapidly shifting landscape that continues to integrate with our daily life. Today, having an easily searchable online identity that is inseparable from your own is considered a boon both in and outside of the workplace, and is often considered essential to maintaining a modern social circle. Half of internet users recycle their passwords, a practice that’s been shown to present a significant security risk, especially when it comes to the possibility of a data breach. The volume of stolen data increased 40% from 2015 to 2016 alone. These numbers aren’t just because there’s more information out there, either. Hackers are getting smarter and there are significant incentives for cyber-criminals to engage in and traffic stolen records on a massive scale. Coordinated attacks that exploit fundamental flaws in current data storage practices are becoming more common. As the digital presence of a user increases through multiple online services, all vying for different pieces of personal information, so does the chance that the information they enter may be compromised. Even with relatively limited access, attackers can combine what they’ve obtained from now-infamous breaches with publicly available info to further compromise a user’s identity to various ends. Just three months remain before companies that process the personal data of those within the EU must be in compliance with the General Data Protection Regulation (GDPR). Yet, there are often still outstanding questions around some of the key changes that will go into place and their impact on various parts of an organization. This webinar will highlight 10 key considerations that need to be made for controlling how data is accessed, stored, kept up to date, transferred and deleted. It will also breakdown four key steps to take to assure that you are on your way to meeting the necessary requirements. From travel to staffing to babysitting, businesses are creating marketplaces. These ecosystems can only thrive when users feel confident that the data they are providing will be protected and businesses can be confident that the individuals using the platform are who they say they are. As businesses face more regulatory requirements and reputational risks that come with the threat of a data breach, finding efficient ways to manage identity authenticity is even more critical. With information becoming increasingly digitized, how do companies create safe, authentic platforms for their users without increasing the friction that typically comes with that protection? Businesses need to change their playbook for managing online identity. This discussion will focus on how businesses can build secure ecosystems that are founded on authenticity but created to scale with less friction and risk, mitigating the need to hold and secure personal data. Proving who individuals are on the Internet is nearly impossible. Traditional verifications such as credit cards and even user reviews are no longer enough to affirm trust between people in the digital world. Background checks and motor vehicle records are just the tip of the iceberg for what is really needed to validate someone’s identity. As information becomes increasingly digitized, how do companies create safe, authentic platforms for their users without increasing the friction that typically comes with that protection? To validate identities, businesses need to hold personal data making them an easy target for hackers and security breaches. There are multiple channels already available online to monetize this data leading to grave security implications for consumers as well as businesses. And as businesses face more regulatory requirements and even reputational risks that come with the threat of a data breach, finding efficient ways to prioritize authenticity is even more critical. Personal data is essential for your business - to enable trust and safety, to enable personalization of services, to enable growth of your business and to enable verification of identities. While obtaining and managing personal data is necessary, it can be extremely complicated, time consuming and risky. Handling or holding sensitive data can lead to major security threats. Companies are investing more time and energy to effectively acquire, manage and protect the personal information of their users and workforce to the detriment of their own business focus. Additionally, the regulatory requirements and liability that accompany any interaction with personal data continue to increase, putting additional strain on businesses to stay updated and compliant. From a user perspective, as individuals are asked to provide their information more broadly, security concerns and a loss of control become more prevalent, putting once-standard interactions at risk. These put even more pressure on businesses to protect their communities’ information as well as their brand equity. This presentation will discuss what challenges are faced by companies dealing with personal data related issues. We will cover best practices, real world examples and lessons learned as businesses look to increase their access to the answers they need, while reducing their risk and liability. Safely and securely share verified personal information. We simplify the complicated world of personal data and security by taking you out of the middle of it. Evident simplifies the way businesses and individuals share verified personal data. With a simple API integration, Evident reduces the friction and liability associated with collecting personal data for businesses, while empowering individuals to manage when and where their data is shared. Title: Can You Afford A Data Breach?